Central Industrial Security Force has released the applications for head constable post. CISF recruitment 2019 includes 429 vacancies. Interested and eligible candidates can fill their application forms now at the official website cisfrectt.in. The last date for submitting the application is February 20, 2019. The application forms can be filled only through online mode. This recruitment is for level 4 head constable post having a pay scale (Rs 25500 – Rs 81100) Pre revised Pay Rs. 5200-20200 with Grade pay of Rs. 2400/- alongwith other allowances. Candidates who have passes 10+2 only can apply for this post and the age limit of the candidate should be between 18 to 25 years. There are three levels of recruitment before medical examination which includes PST and documentation, OMR or CBT written exam, skill or typing test. 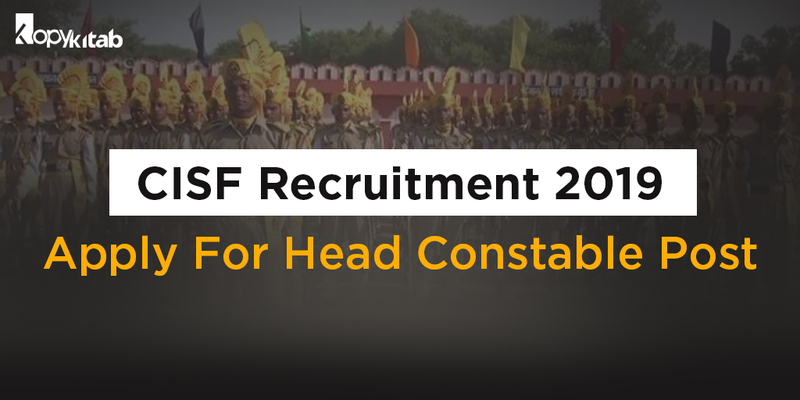 Candidates are suggested to go through the official notification given by CISF. You can find this notification below in the blog. As the filling up of application form for CISF Recruitment 2019 has already begun, candidates can visit the official website to fill their forms or you can click on the below link to fill your application directly. Before starting to fill your application go through the steps given below on how to fill the application form carefully. Step 1: Applications are accepted only through online mode at the official website cisfrectt.in. Step 2: Log on to the official website of CISF. Step 3: Click on Register or Login button. Step 4: If you are a new user click on ‘Register’ tab and fill all the details that includes candidate’s name, father’s name, candidate’s date of birth, candidate’s gender and the verification Text. Step 5: Click on submit to proceed further. Step 6: If you are a registered user then no need to register again. Directly you can start with filling up of application. Step 7: Enter ‘personal details’, ‘Basic details’ and ‘contact details’ as appeared. Step 8: Enter all required field and then click on ‘submit’ button. After completing the registration process succesfully, you will receive a provisional Registration ID and password on your registered mail id and mobile number. You can later login to upload necessary scanned documents like photograph, signature, Birth Certificate, Matriculation Certificate, Intermediate or Senior Secondary School Certificate (10+2), ID Proof with photographs, SC/ST certificate for candidates applying under reserved categories. You can view/edit your application by clicking on view/edit option under new registration. SC/ST/Women/ Ex-Servicemen category candidates are exempted from paying the application fee. Here is the official notification by CISF. You can know all the details of exam, eligibility, application, exam dates, syllabus and more. Candidates are suggested to go through the notification, steps to fill application form before moving on with filling up of applications. After completion of filling application forms, candidates can start their preparation with all latest updated CISF Preparation Book. Buy various publication books from a wide range of collection available online. For all latest updates on CISF Recruitment 2019 stay tuned to our blog.